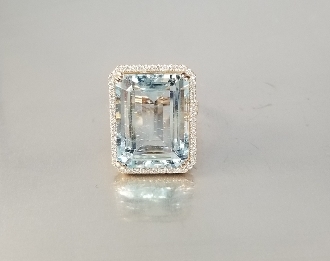 This emerald cut aquamarine ring is set in solid 14 karat rose gold with diamonds around the center stone. Total weight of the aquamarine is 19ct. Total diamond weight is approximately 0.66ct. Aquamarine is the birthstone for the month of March. Please llow 6-8 weeks for production.